"Why don't you just reel?" It came from an angler who was watching every move I made as I fought a beautiful rainbow hued wild steelhead buck. It was a strong fish and, as he tore against the line, time and time again, I had many opportunities to explain to my intent observer, whom I learned was a novice at steelheading , my successful tactics against these magnificent powerful fish. "Above all else," I told him, "I use the pool to my advantage. Before I even hook a fish I make a mental image of all hazards and currents which a fish could use to his advantage and then plan my strategy against it." "Every steelhead pool has 5 basic sections," I explained, as the buck made short dashes, "the two shoreline shallows on each side; the tailout shallows where the water flows out of the pool; the shallow headwaters where the river enters the pool; and the actual deep water of the pool, either as a trough created by sloping banks, or a wide depression in the river." In this particular pool, there was a deep trough immediately below the head of the pool which was enlarged by a shoreline backeddy. It was to this backeddy that I was walking the buck so that he would think he was running downstream when in reality, while he faced downstream because of the flow of the backeddy, his 'downstream' run was actually a run to the head of the pool. As long as I could keep him in this location, I would have a chance to tire him before he swam into the main current to swim over the downstream log jam where he was certain to escape. "Walking a steelhead upstream is a skill used by most steelheaders," I assured the angler. "First , you reel your line tight to the fish and then, with rod bent at the fish, you slowly walk upstream pulling the fish up the pool. This method stops the irritating jerking caused when you reel, and, appears to give the fish some sense of control. But, be prepared in case he suddenly begins a run. By having a bend in your rod there will not be a sudden start which could break your leader." "I have beached many hundreds of steelhead in my years of hunting these magnificent trophies," I told the angler who was now being most helpful by giving me a three point stance by holding my coat up in the fast water at the head of the pool; " but, it is the initial reaction of the fish when he realises that he has been hooked, when I am most tense. Like aircraft landings and takeoffs, the most hazardous times, it is the strike and beaching that are the most telling!" "The first questions that flash through my mind," I continued, "are directed to my tackle and the fish!" "Will the hook hold? Will he go upstream or down?" At that moment the buck broke water, tailwalking away from me as he fought the pull off my line. "Easy, easy! ", I exclaimed, easing off on the thumb pressure I was applying on the single action fly reel. "When he runs, let him go! Too often a good fish has snapped my leader simply because I applied too much pressure during these panic surges. Let the rod tire the fish!" "Tight lines! is more than just a farewell to your fellow anglers, it is the technique you must master if are to finally beach your trophy." "Remember," I told him, "a hooked fish is constantly trying to work the hook out of it's mouth. It does this by rolling it's jaws, working at the hook with it's tongue and by rubbing the hook on bottom gravel and rocks. A moment of slack usually means a lost fish!" "Will he go upstream or down? This is the primary action of the fish," I told the attentive angler, "which demands immediate attention! 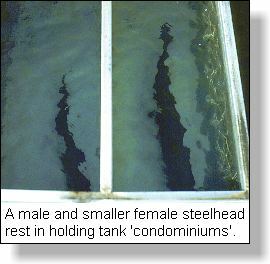 Usually a steelhead is hooked in the tailout of a pool. Its first reaction is to escape and this it does by using the natural element where it exists. 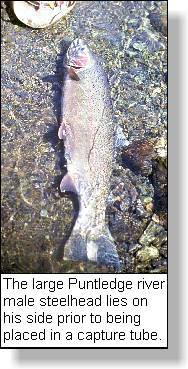 High water and fast flows will usually enable the fish to dash out of the pool and head downstream." "This is the origin of the steelheader's call, "FISH ON!" "If I can keep the fish in the pool successful beaching is almost assured. But, steelhead don't always co-operate. If my fish runs downstream I quickly strip line off my reel to create a downstream belly in my line. When he feels the downstream line pull the fish will often halt and slowly begin to swim back upstream. I wait until the fish is once more holding in the pool before I reel in slack line. To ensure that the hook is not slack in the mouth I will keep my rod tip pointed downstream, flat to the river, in the water." By this time I had the buck in front of me and was beginning to reel him closer and closer to the gravel beach. Over my shoulder I carried a fish tube. I was determined that this wild beauty was destined for future hatchery stock! I asked the attentive angler to take it and slip out one end into which I could guide the buck. I constantly chattered to the novice as I made each adjustment to this powerful fish. I then highlighted those key elements which need to be considered once you have the fish pooled. "Keep a firm pressure on the fish but let the rod tire him!" "Keep the rod tip up!" "Remember to 'bow-to-the-fish' when he leaps!" 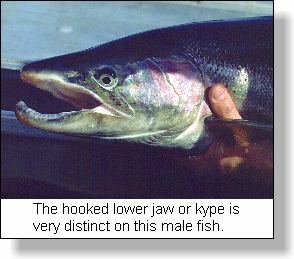 "Watch that your line is not frayed by instream boulders or ledges"
"Be careful of the streamside canopy which could hinder your rod"
This was a particularly important steelhead. I was fishing on the Puntledge River using a most successful 'Campbell Pink' pattern, particularly effective in clear waters. A large male was needed at the hatchery for the winter steelhead program and this fish was perfect. By this time I had the fish tired to the point where it lay up on it's side in the shallow water. "Never ever," I emphasized, "underestimate the skills of a steelhead for escape! I have lost more fish at the beach when I get too anxious and careless! Now, I make certain that he is well played out then slowly ease him to a shallow section where he can be released or, brought up on an open beach if he is to be a keeper." By now the buck was on his side near my waders. I slowly reached down and with care, eased him head first into the plastic tube. Dropping the lid, I snapped the lock in place. 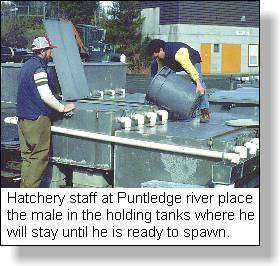 Together we walked to the hatchery where hatchery staff brought the tank truck to transport the fish to the steelhead holding condominiums.